Sit Tsui is an associate professor at the Rural Reconstruction Institute at Southwest University, Chongqing. Erebus Wong is a senior researcher at the Kwan Fong Cultural Research and Development Program at Lingnan University, Hong Kong. Lau Kin Chi is an associate professor in the Department of Cultural Studies at Lingnan University. Wen Tiejun is director of the Rural Reconstruction Center at Renmin University, Beijing. All are founding members of the Global University for Sustainability. This is the second of three articles by Sit Tsui and her coauthors offering a Chinese perspective on current issues in global political economy. MR thanks Zhihe Wang for his assistance in editing this article. Translated from the Chinese by Alice Chan. 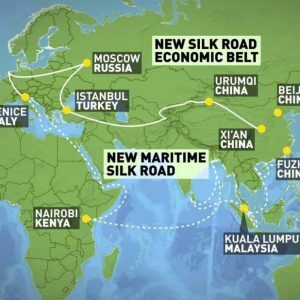 In late 2013, Chinese premier Xi Jinping announced a pair of new development and trade initiatives for China and the surrounding region: the “Silk Road Economic Belt” and the “Twenty-First-Century Maritime Silk Road,” together known as One Belt, One Road (OBOR).1 Along with the Asian Infrastructure Investment Bank (AIIB), the OBOR policies represent an ambitious spatial expansion of Chinese state capitalism, driven by an excess of industrial production capacity, as well as by emerging financial capital interests. The Chinese government has publicly stressed the lessons of the 1930s overcapacity crisis in the West that precipitated the Second World War, and promoted these new initiatives in the name of “peaceful development.” Nevertheless, the turn to OBOR suggests a regional scenario broadly similar to that in Europe between the end of the nineteenth century and the years before the First World War, when strong nations jostled one another for industrial and military dominance. The OBOR strategy combines land power and maritime power, bolstering China’s existing oceanic hegemony in East Asia. Historically, at the time of the Tang Dynasty (618—907), China’s expanding trade with the West motivated the Islamic world to exert control over the trading routes of Central and West Asia, forcing Europe—under the pressure of a silver crisis caused by continuing trade deficits—to seek eastern trading routes that would allow it to bypass the Islamic regions. One after another, Spain, the Netherlands, the United Kingdom, and eventually the United States became dominant maritime powers, protecting and expanding their trade interests in East Asia. If the OBOR project were merely “one road,” it would be little more than a traditional land-power strategy, but OBOR opens up secondary maritime power along China’s coast, backed by the vast expanse of country’s landmass. At the turn of the twentieth century, the English geographer Halford John Mackinder proposed that a strong power integrating the transportation and trading channels of Europe, Asia, and Africa into a single “World-Island” would be ready to dominate the globe.2 In 1919, he wrote that “who rules East Europe commands the Heartland; who rules the Heartland commands the World-Island; who rules the World-Island commands the world.”3 In practice, however, it is still necessary to coordinate control of land routes with maritime transportation along the coast of this World-Island. OBOR depends on a series of delicate geopolitical calculations. Today only three nations can be considered continental powers: China, Russia, and the United States. 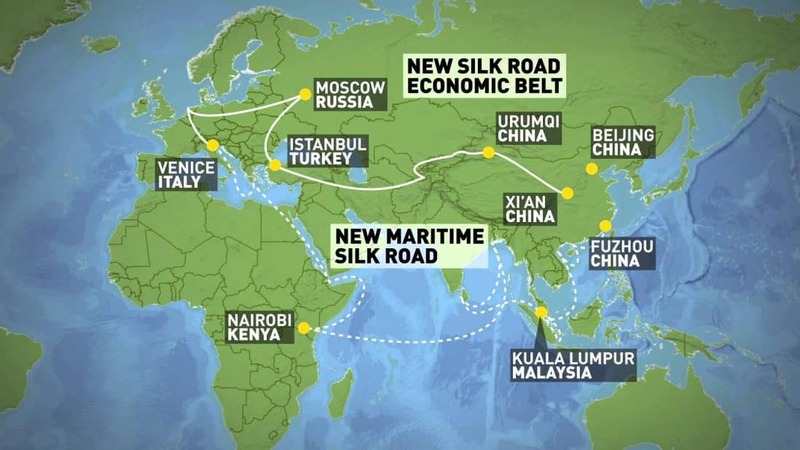 China cannot simply open a new inland Silk Road, because it would inevitably have to pass through Russia. Ever since its emergence as an imperial power in the late eighteenth century, Russian geopolitical strategy has been oriented toward Europe, with only secondary attention given to East Asia. This partly explains why, as its economy benefited from a surge in oil prices several years ago, Russia took little notice of China’s Silk Road proposal. Likewise, Russia took the lead in negotiating the new Eurasian Economic Union, meant to integrate and link Europe with the former Soviet countries of Central Asia. Putting it bluntly, it was not up to China to integrate Central Asia. However, in the aftermath of the Ukraine crisis, Russia faces hostility from Europe and the United States, and with the global drop in oil prices, the country has no choice but to turn east and seriously consider China’s proposal for a trans-continental strategic partnership. Yet if relations with Europe were to improve, Russia would promptly turn back toward Europe. No matter how closely tied their regional interests become, neither Russia nor China can put all their eggs in one basket. That is why China’s land-power strategy is being presented as OBOR, a distinctly Chinese project. Nevertheless, China is aware that the United States would counter the OBOR effort by strengthening its alliance with capital interest blocs within China—both inside and outside the ruling clique—to reassert its influence over China’s future development policy. Indeed, in this respect the United States has already had much success: the Chinese financial bureaucracy accedes to the unwavering primacy of the United States as the world’s central bank, making it unlikely to question, much less undermine, U.S. leadership in the global order. Nevertheless, there is little doubt the United States will adjust its diplomatic strategy with regard to OBOR. Iran, for example, is an important part of the OBOR proposal, and whatever its other aims, the U.S. nuclear agreement with Iran was a strategic adjustment meant to balance China’s influence in the region. For such a small place, Singapore has long had an outsize influence and strategic importance. With the Strait of Malacca, it controls a vital access point for the maritime trade routes connecting Europe, Africa, and Asia. Singapore clearly understands that its survival depends on a balancing act between the West and China. The West valued Singapore’s first prime minister, Lee Kuan Yew, an ardent Cold Warrior determined to stop the spread of Communism in the region. Thus, despite Lee’s close ties to Chinese officials and their sympathy for the authoritarian efficiency and corporatism of his “Asian values” ideology, Singapore would never become a Chinese ally. Lee remained loyal to U.S. interests to the end: shortly after Obama took office, he advised the United States on its diplomatic “pivot” to Asia and the Pacific, and opened up military ports to assist with new U.S. military deployment within the Association of Southeast Asian Nations (ASEAN) region. Given this legacy, China harbors no illusions about Singapore’s allegiances. For these and other reasons, China wants to open up another transportation channel from southwest China to the Indian Ocean, bypassing the Strait of Malacca. Another potential southbound route would pass through Pakistan or Bangladesh to the Indian Ocean. In either case, the goal would be to connect with Sri Lanka, where a new, world-class harbor would open up one more entrepot in the Indian Ocean. ASEAN is the starting point of the maritime Silk Road proposed by China, but it is also the region most fraught with complexities, and where U.S. influence is most deeply rooted. In recent years, China has taken a leading role in the establishment of a new set of international economic institutions, including the New Development Bank, the BRICS Contingent Reserve Arrangement, the AIIB, and the Silk Road Fund, as well as the Shanghai Cooperation Organization. Together they represent a regional counterweight to Western-led entities like the International Monetary Fund (IMF) and the World Bank—and more recently, the European Central Bank—that have dominated the global financial order since the introduction of the Bretton Woods system after the Second World War. China is arguably only the third country in history, after Britain and the United States, with the capacity to shape and lead a global system of finance and trade. Of course, in the foreseeable future, China will not replace the U.S. dollar system; it could at most stand on equal footing. After the United States overtook the United Kingdom to lead the world in industrial production capacity in the late nineteenth century, it took another fifty years and two world wars before it could dominate global finance. China recognizes this reality, and has consistently promoted the AIIB and other organizations as complements, not competitors, of the World Bank and Asian Development Bank (ADB). Over the next decade or so, as long as no major instability unsettles the Chinese economy, it seems inevitable that the renminbi will become one of the most important international currencies. Nevertheless, it is far from clear that the renminbi, even in twenty years’ time, could challenge the hegemonic status of the U.S. dollar. As a capitalist economy industrializes, the strength of its currency depends on the country’s continued productive capacity, supported by the government and civil society. However, in the subsequent phase of financial capitalism, the main source of a currency’s credibility is the political and military strength of a country. From this perspective, the impregnable position of the U.S. dollar as the world’s credit currency arises foremost from the United States’ enormous military strength. The United States accounts for 40 percent of global military spending, more than that of the next ten countries combined. Of course, a continually expanding military hegemony has not been the only source of U.S. financial dominance. Since the Second World War, private firms and government agencies in the United States have led the world in technological innovation, not only in arms manufacturing, but in chemicals, semiconductors, film and television, aviation, computers, finance, communications, and information technology. All of these innovations have facilitated the global expansion of capital’s high value-added. The foundation of the U.S. dollar’s value, besides American military and political strength, is thus the United States’ monopolistic innovative capacity in raising the value-added of capital. In China today, a spirit of utopian capitalism is rampant at all levels of the economy, driven by the belief that as long as state-owned enterprises continually withdraw or dissolve, to be replaced by private firms, then China will be blessed by some miraculous market power with an innovative capacity for high value-added. But without an enormous investment in systematic research and development, it is unclear how scattered concentrations of private capital in China could make such advances in the near future. Consequently, China’s currency is unlikely to challenge the U.S. dollar, or even the Euro. Ironically, the single force that seems most likely to bring down the U.S. dollar is the increasingly virtualized U.S. financial system itself. In exporting capital over the past decade, China lacked any overall planning for foreign investment and development, sometimes entangling it in geopolitical crises, as in Libya or Sudan, other times in bureaucratic morasses, as in its role in the Mexican high-speed rail and Sri Lanka harbor projects. This misdirection resulted from the lack of any strong support and coordination from financial organizations like the AIIB. While China has become an important capital-exporting country, it has largely avoided entering into explicit political or financial alliances that might protect its large-scale foreign investments. With the establishment of the New Development Bank and the AIIB, however, China’s financial ties to neighboring nations have become more formal and far-reaching. From this perspective, they represent the kind of transnational institutional construction needed to give greater focus and strategic leverage to China’s capital exports. The first European country to join the AIIB was reportedly Switzerland. However, because Swiss officials wanted to keep their negotiations with China secret and postponed announcement of the decision, Britain was the first European country to officially announce its participation. That both Switzerland and Luxemburg, strongholds of financial capital that have previously declined to join most international organizations, have now signed on with the AIIB, suggests that the Bretton Woods alliance faces deep internal fissures. We can call it the Bretton Woods system’s Triffin Dilemma: the interests of the United States and those of its longtime allies are beginning to show potentially insuperable contradictions. The institutional coherence of this alliance has been slipping for some time. A primary purpose of the Bretton Woods system was to facilitate exports of excess industrial capacity and capital from the United States. The interests of postwar growth in the United States and recovery in Europe were in line. In 1971, when the Nixon administration unpegged the dollar from gold and the United States began to export liquidity on a large scale, these moves likewise seemed to serve the interests of European financial institutions. However, over the last two decades the fundamental needs of the two have come into conflict. Reforms within the IMF have stalled, because the United States does not want to give up its veto power, while other international financial organizations long dominated by the United States have proven unable to accommodate the rapid rise of East Asian economies. The AIIB, led by China, is a clear outcome of these trends. The establishment of the AIIB puts the United States in an awkward position, because it marks the first significant defection by its close allies since the advent of the united front of Western capitalist countries after the Second World War. The United States has sharply criticized its European partners, particularly the United Kingdom, which has responded in kind. South Korea and Australia were discouraged from taking part, only to join at the last minute. Of the major U.S. allies, this leaves only Japan, eager to regain its regional military standing, and Canada, which has been indifferent from the beginning. In addition to these tensions in the U.S.-led financial order, there are signs that United States’ political alliances in both Europe and Asia are under similar strain. For example, it is very difficult for European allies, particularly Germany, to follow the hardline, neo-Cold War stance of the United States toward Russia, where German economic interests are so deeply embedded. Of course, saber-rattling aside, the United States does not really want to make war with Russia. The former’s broader geopolitical goal is to foment conflicts between Europe and Russia, the better to inhibit the development of a strong Euro-Russian-Central Asia integration. With the Ukraine crisis, the United States hopes to further isolate Russia from the rest of Europe, with only halfhearted assistance from Western European governments themselves. Similar contradictions have arisen in Asia. South Korea and Australia are key partners in U.S. efforts to contain China, as well as members of the TPP. Yet they, too, have joined the AIIB, in an implicit dissent from overbearing U.S. influence. Only Japan, a holdout from both the TPP and the AIIB, remains a faithful ally, largely because of continued U.S. support for its military expansion. The long and narrow Japanese islands are scarce in resources, and to become a strong nation it is necessary to build maritime power and expand. At the end of the nineteenth century, Japan defeated the navy of the Chinese Empire, then scored victory against Russia to become an overlord of the region. Next Japan wanted to challenge the strong maritime power of the United States, but was defeated and occupied, ultimately becoming a vassal of U.S. maritime power. In any case, the prevailing political ideologies in the two countries have long been mutually compatible. South Korea has for decades been Japan’s main regional rival. A united Korea would be able to challenge Japan in terms of its population, military, and industrial capacity. But for now, South Korea has turned to China as its most important trading partner, and the two nations have signed their own free trade agreement. Even on the question of future unification, South Korea would ultimately need China’s help. However, the prospect of a united Korean Peninsula holds little appeal for the United States, since the formidable trio of China, Korea, and Japan would compete directly with the United States in East Asia. Furthermore, in the event of unification, it is doubtful that the new Korea would be willing to give up its nuclear capabilities, driving it eventually to seek military independence from the United States. Thus, whatever their outward affinities, the long-range interests of the United States and South Korea are likely destined to come into conflict. Even Japan, the United States’ closest ally in Asia, may yet go its own way. The country is coping with an excess of capital, and is anxious for new outlets for its industrial exports. The country’s leading corporations thus hope Japan will eventually join the AIIB. These trends are hardly new: after the 1997 Asian financial crisis, Japan moved to establish the Asian Stabilization Fund, which would have made it the dominant financial power in Asia, only to have it vetoed by the United States. Japan leads the ADB, but ultimately has to abide by U.S. directives. The region has an annual demand of $800 billion for infrastructure investments, yet the ADB has only approved $13.5 billion. The drive toward military expansion has kept the ruling Liberal Democratic elite in Japan firmly behind the United States, but in the long run Japan’s subordination of its own regional interests to U.S. strategy may prove unsustainable. As the legitimacy of the United States’ sole-superpower status has slipped, the interests of other national blocs and alliances have grown more diverse. Internal contradictions among the United States and its close allies are deepening by the day. It will require careful planning and keen strategy for China to find its best position in this changing global order. Over two decades of rapid growth, China has kept a low diplomatic profile relative to its size and strength. In the coming years, China’s diplomacy will need new ideas and tactics. From the 1950s through the 1970s, the United States successfully exported an ideology of industrial development that suited its economic and military interests alike. After this World Bank-directed developmentalism had left many emerging countries impoverished and mired in foreign debt, however, U.S. diplomatic discourse shifted in the 1980s toward institution-building, democracy, and liberty. In particular, after the first Gulf War, the cause of “liberty and democracy” became the main theme of U.S. geopolitical ideology. However, in the last decade, imperial adventures in Iraq and Afghanistan have sparked a concatenation of regional conflicts, not only causing death and displacement on a massive scale, but fostering the rise of organizations like the Islamic State. Official talk of liberty and democracy, always disingenuous, has been decisively discredited. “Security” and “stability” are now the watchwords of U.S. strategy; the old causes of global peace and prosperity have fallen victim to the United States’ own catastrophic interventions. The official ideology behind OBOR, by contrast, is peaceful development—to sponsor infrastructure investments and facilitate economic development, promoting cooperation and minimizing conflict. There is no doubt that peaceful development is more sensible and sustainable than American-style militarized “security”; poverty and injustice are hotbeds for extremism. Yet the discourse of “peaceful development” has its own blind spots, which reflect China’s domestic contradictions. For instance, how can the AIIB avoid the damage done by the World Bank and others to the environment and indigenous livelihoods? How can China promote infrastructure investments that drive local development through diversity and sustainability, and not simply serve its own need for export outlets? The challenge, in other words, is to ensure that the AIIB and Silk Road Fund do not simply become East Asian counterparts of the IMF and World Bank. Given that OBOR is a contest for institutional influence in East Asia, the deciding factor for success or failure may be the competitiveness of its guiding discourses. China must promote a message of social justice and equitable development to counter the soft power of institutional transition that the United States has pushed since the 1980s. Since the end of the Qing Dynasty (1644–1911), as China has undergone a series of struggles for national independence and unity, rural society has been central to the structure of government. Whenever one of the traditional mechanisms of local governance has come under attack, threatening the livelihoods of peasants and villages, serious social conflicts have erupted, sometimes to the point of provoking peasant uprisings. From the collapse of the Qing to the demise of the Republic of China in 1949, violent peasant-led revolts were all too common. But where it was possible to make effective use of the traditional social and economic institutions of rural society, peasant communities were integral to the country’s development. In particular, during the last few decades of industrialization, the Chinese countryside has become the source of a vast “labor reserve,” allowing the state to rely on sannong—the so-called “three rurals” of peasants, villages, and agriculture—as the foundation of China’s turbulent but continuous modernization over the last sixty years. ↩This paper is an outcome of the sub-project on “International Comparative Studies on National Security in the Process of Globalization,” led by Sit Tsui, Southwest University, as part of a larger project, “A Study of the Structure and Mechanism of Rural Governance Basic to the Comprehensive National Security,” led by Wen Tiejun at Renmin University, Beijing, and funded by the National Social Science Foundation of China (No. 14ZDA064). ↩H. J. Mackinder, “The Geographical Pivot of History,” Geographical Journal 23 (1904): 421–37. ↩H. J. Mackinder, Democratic Ideals and Reality: A Study in the Politics of Reconstruction (Washington, DC: National Defense University Press, 1996), 150.